#IMD2011: Museum, Memory, and "Goshka Macuga: It Broke From Within"
The theme of International Museum Day this year is Museum and Memory: Objects Tell Your Story. What could be a more perfect tie-in than our current exhibition, Goshka Macuga: It Broke From Within? The theme of the exhibition was born out of Macuga’s research into the Walker’s history and the lumber business of its founder, T. B. Walker. It features many objects from the Walker’s archives—including works by Carl Andre, Joseph Beuys, Marcl Duchamp, and Sherrie Levine— and sets them against a wall-sized tapestry with individuals and artifacts from her research woven into the design. So today I wanted to share a feature from the May/June issue of the Walker magazine, which talks about each figure in the tapestry and their connection to the Walker’s story. Walker artist-in-residence Goshka Macuga has received international attention for her use of institutional histories as a staging ground for inventive and ambitious proposals. In two trips to Minnesota in 2010, the London-based Polish artist developed an exhibition using vignettes from the Walker’s long history to explore the changing status of the art object, the nature of democracy, and the role of art in society. 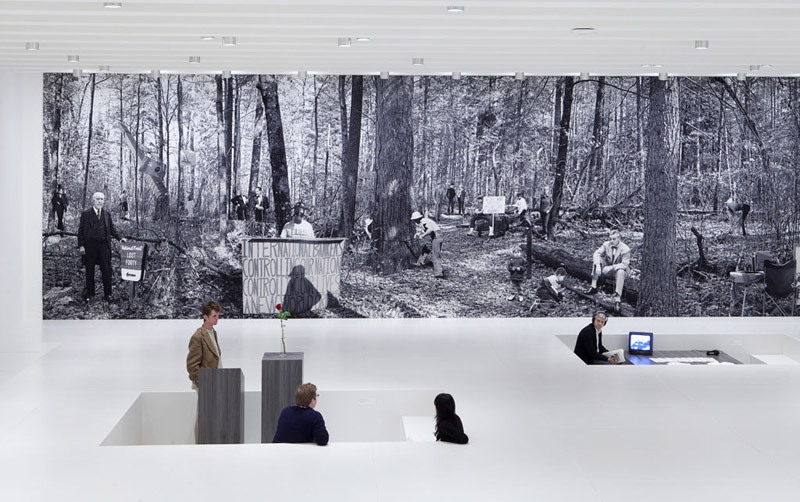 The centerpiece of the exhibition Goshka Macuga: It Broke from Within is a monumental tapestry of sun-dappled white pines in which the artist has collaged individuals related to her research. Many of the characters she brought to the scene are specifically related to the institution’s past, but hopefully hint at the more complex history of the United States at large and the ever evolving nature of the Walker’s contract with its community. 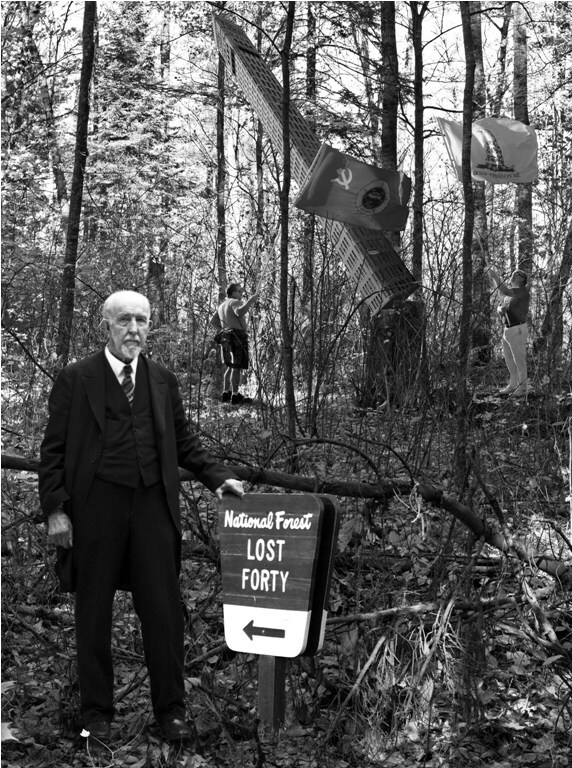 Thomas Barlow Walker, the institution’s founder and legendary lumber baron, stands in the foreground, hand resting on the Lost Forty sign. The original Walker Art Gallery opened in 1927, and Walker passed away just a year later, after which it was run for a time by the Walker family foundation. The Foshay Tower in the background was sourced from the same image used in William Wegman’s What Goes Up Must Come Down, a 1970 billboard painting of the tower lying on its side, part of the controversial 1970 public art exhibition 9 Artists/9 Spaces. The billboard, situated on the University of Minnesota campus, was removed soon after it was installed because residents believed it to be a bomb threat. The former Walker director appears with artist Marcel Duchamp—a foundational figure in 20th-century art—sipping cocktails at a reception for his 1965 exhibition Not Seen and/or Less Seen of/by Marcel Duchamp/Rrose Sélavy. Edward Larrabee Barnes, architect of the 1971 Walker Art Center building, stands to the left of Jacques Herzog and former Walker director Kathy Halbreich. The Swiss architecture firm Herzog & de Meuron designed the Walker’s 2005 expansion, a project initiated and steered by Halbreich during her tenure. To their right is current Walker executive director Olga Viso. The German artist is pictured at his 1974 press conference at Dayton’s Gallery 12, an exhibition space in the downtown Minneapolis department store. Beuys sits on a log with a glass of milk beside a Tea Party demonstrator whom Macuga photographed while visiting a Tax Day demonstration at the State Capitol in St. Paul. On his first US trip, Beuys outlined his belief that art provided the only effective means to a just politics. Daniel Defenbacher became the first Walker Art Center director in 1940 when the Depression-era Work Projects Administration (WPA) joined with the Walker family foundation to revitalize and reimagine the Walker Art Gallery as a community center employing local artists and offering classes in art and dance as well as performances and exhibitions. The artist is pictured taking a photograph during her visit to the Lost Forty in the fall of 2010. She was accompanied by Walker staff photographer Cameron Wittig, who captured multiple shots of a series of scenes chosen by the artist. Later the images were combined via computer, re-creating five vistas from which Macuga selected the version reproduced in the tapestry for the exhibition. Bookending the tapestry is US soldier Tom Pripish, photographed on his way home from the Vietnam War, and an “Uncle Sam” look-alike associated with German art historian Aby Warburg’s first trip to America in the late 19th century, which included visits withvarious Native American tribes. “I am using Uncle Sam and the Vietnam vet as symbolic figures rather than specific things,” says Macuga.